Italian wine and pizza party @ Conrad’s! As mentioned in a recent blog post we were sent some wines from Jim’s Cellars and decided to have a few people over to help us enjoy them with some antipasto and a few slices of pizza. 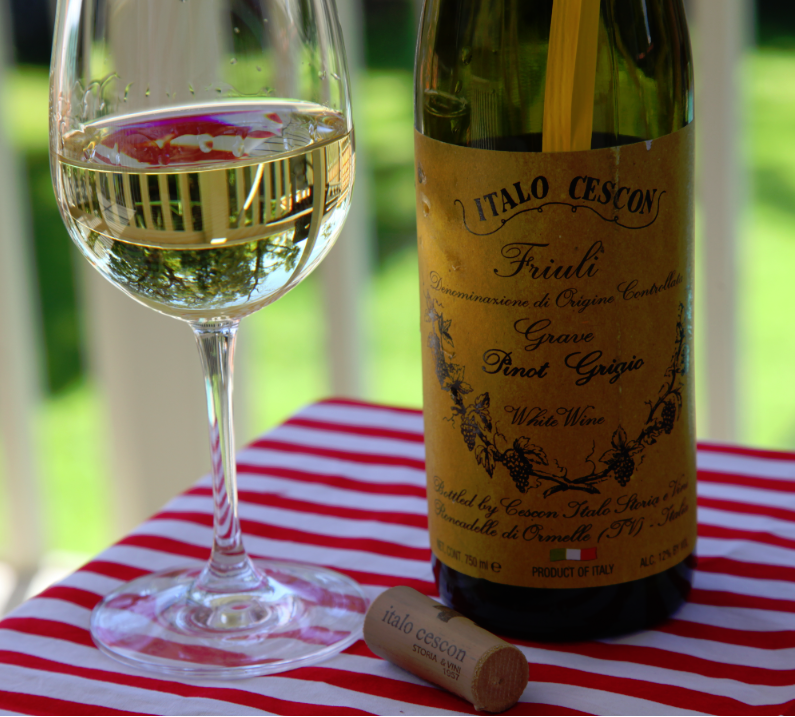 We purposely chose these Italian wines because our readership stretches way beyond our local shores so most of you will be able to source at least a couple of these, and they are available through Jim’s Cellars of course. The weather was perfect on Sunday as we sat out on the deck sipping some enjoyable little Italians catching up on the latest. 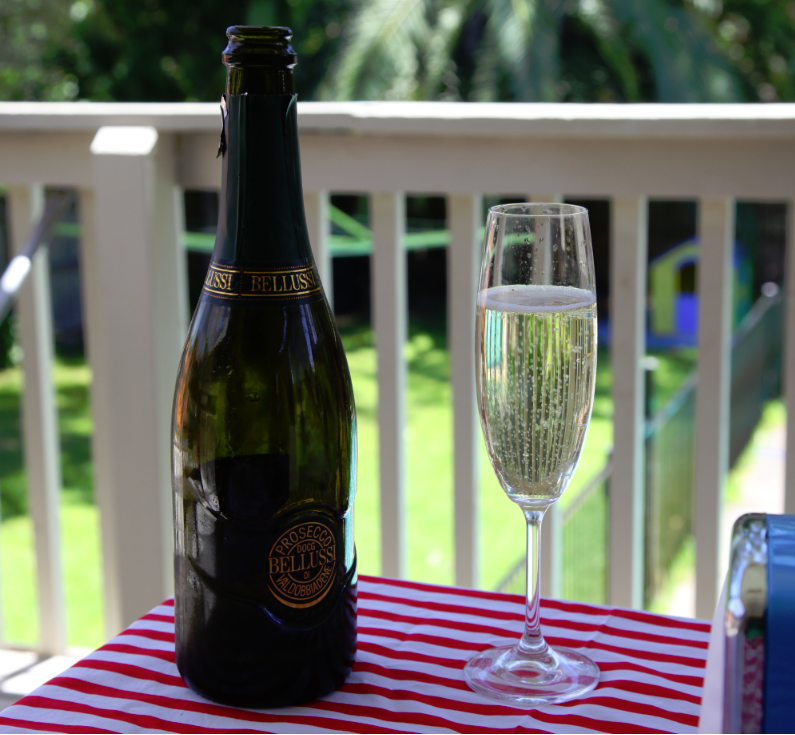 a really enjoyable daytime fizz, give me a whole bottle! People did think it was a little more expensive than it actually was so it is quite decent value and totally suits the outdoors on a nice sunny day. 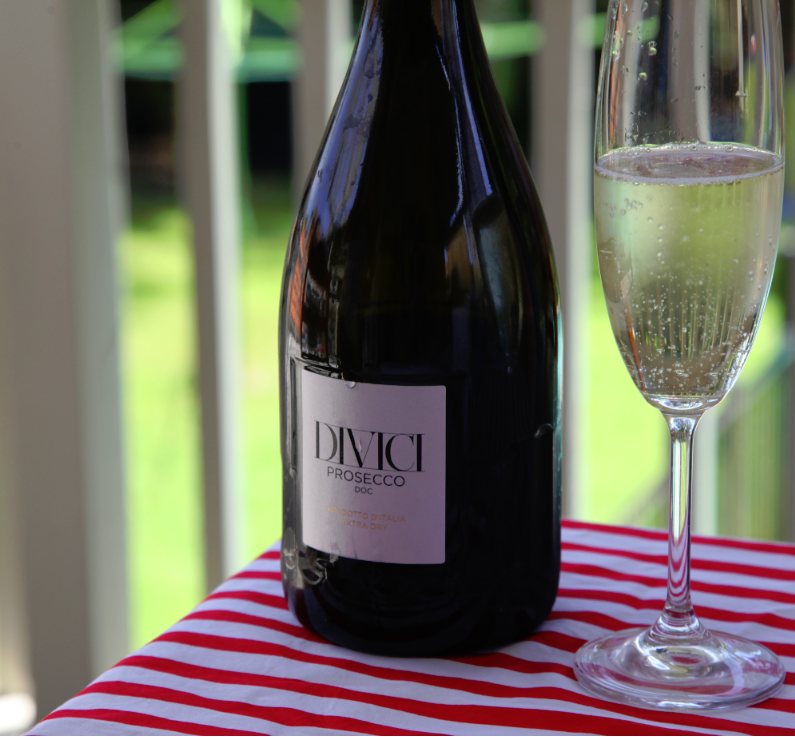 Both these bottles of Prosecco were spot-on for the sunny outdoor lunch matched with antipasto or light and salty pizza. Yum! If I were to rate one above the other I’d go with the Divici for the value factor but both were enjoyable fizz and worth trying. a light and quite enjoyable red reminiscing merlot. A smooth operator! a couple of people’s favourite, but that was controversial and stuff was thrown! This was a thoroughly enjoyable wine that went very well with the BBQ duck and bacon pizza. Neal ended up buying half a dozen himself from Jim’s Cellars (anonymously) and was stoked to discover that delivery was only $5 and it was shipped quickly. Good value all around in this one! 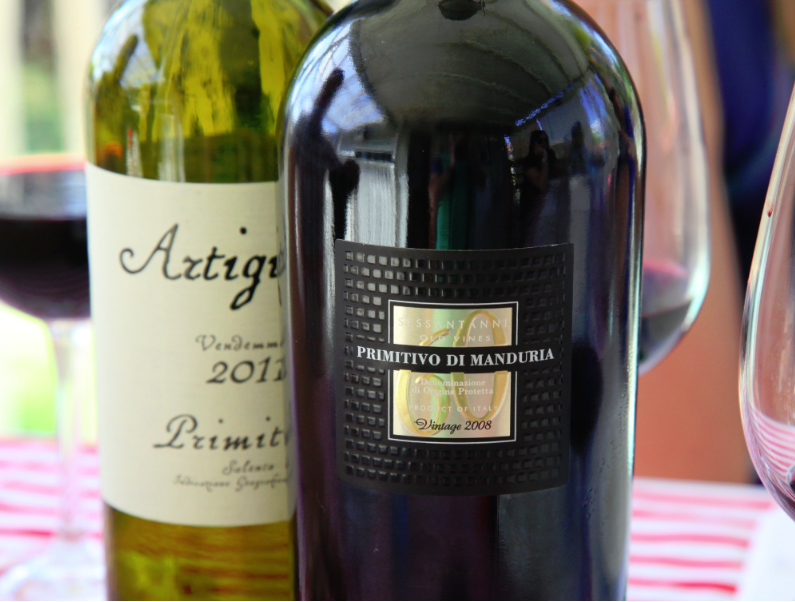 Next was the 2009 Primitivo di Manduria Sessantanni from Puglia and retailing for about $50. To cut a long story short, I actually like this one and could smell sweet fruit and then discovered tastes of plums and coffee with a decently long aftertaste but there was a level of sugary sweetness that hit me straight away and which put most of the rest of the table slightly off it. If you want a red with a bit of sweetness then you’d like this. 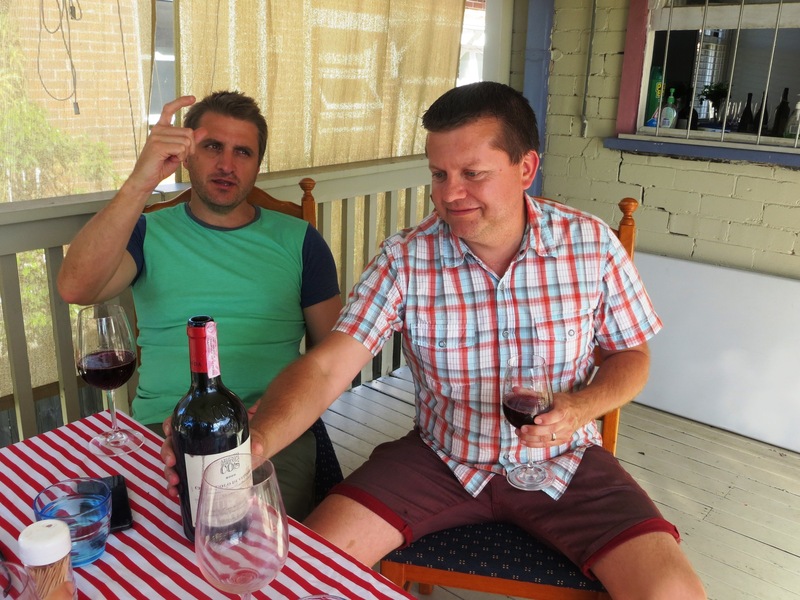 I then pulled out one of my own wines as I had wanted Neal to try it for some time, the 2009 Azienda Agricola COS Cerasuolo di Vittoria Classico. I won’t go into this wine too much in this post as you can read about it here. Everyone really liked this one including my wife who was unsure about it the first time. Looking at the photo, I am wondering what Neal is sizing up… hmmmmm. 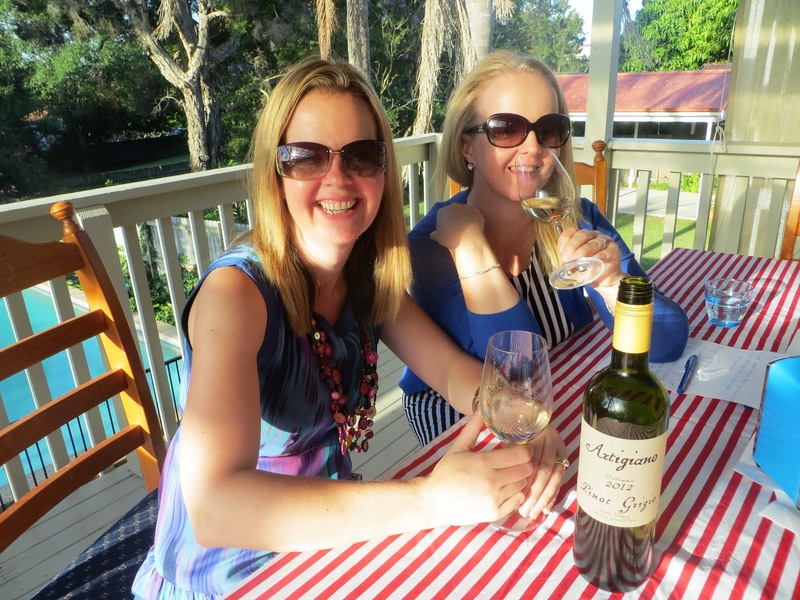 Over 7 hours of fun… It was the perfect lazy Sunday arvo indeed! 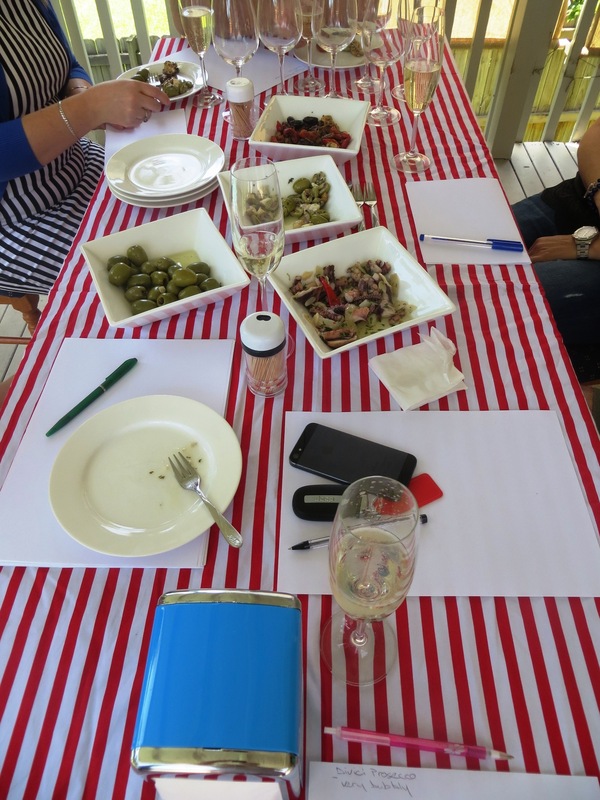 Looks like a wonderful way to spend a lazy Sunday…nice bunch of wine, too. I finally tracked down that sparkling shiraz at a wine bar in Port Angeles (of all places) Really liked it! Yeah, a great Sunday arfternoon. I’m glad you found a sparkling shiraz and enjoyed it. Bonus! I hope you guys realize that you lead us constantly astray (but we love it!). Looks like you had a great time, conducting a wine tasting with friends and pizza. Now this is how to enjoy Summer! There’s a LOT of information here, and I thank you for it. Sounds like a wonderful way to spend an afternoon! A dry prosecco? Count me in! It is because of the non-alcohol days that make us appreciate the grapes even more, especially when mixed with good friends. A nice collection of wines you tried with pizza. Enjoy more days like this. Makes me thirsty! And hungry, too. Cheers! And thanks for your frequent visits!! And to you, my new friend! A note of regard – To Mister Wanker, I enjoy the topic of your blog, the insight provided and very much like the humor in your writing/blog persona. I regret not to be a party of such gatherings and would very much like to have a glass ( or a shot) with my fellow drinkin-writer. Can’t find the address of the party?!? Must be an error somewhere !?!!? Initially I thought you were inviting all of us to a pizza party 🙂 Looks like a nice place you got there! LOL! I’d have to make sure I’ve got some tea on for you though Mabel. 😉 It’s actually quite an old Federation house but has loads of room and a great outlook so can’t complain at all. Very cosy. Very thoughtful of you, Conrad 🙂 But really, a Wine Wankers pizza-fine-wine party wouldn’t be such a bad idea someday! I think this first reviewing samples post came up very well, the setting and the comments were interesting to read. Thank you AuAu! I made sure that it was all within our own context. The only difference is that these wines were given to us rather than coming from our own cellar. 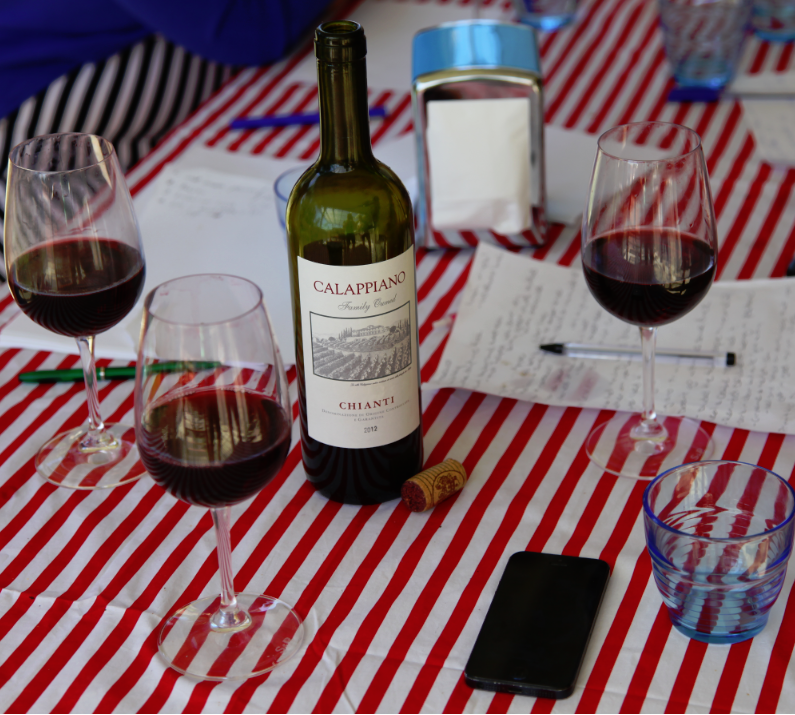 When I drink alcohol, which is not all that often really, I usually drink wine…I am learning so much about it here. I had never thought of pairing it with pizza. I think I’ll give it a try this weekend. I nice glass of red wine with pizza… yum! I’m glad you’re getting something out of our shenanigans and thanks for your visits. Very enjoyable post!! pardon, Great post! Thank you so much Luana! It’s always great to see you pop in. Cheers! The only sweet wine I’ll touch is Sherry, everything else has to be bone dry. Prosecco rocks, and in northern Italy is traditionally served with thin-sliced meats. Antipasto is southern Italian and the combination of pizza toppings almost sounds American. I go for the traditional toppings and plain cheese. The day’s spread was quite a cultural array! Thank you! It’s great to see you pop in from time to time. Cheers!! 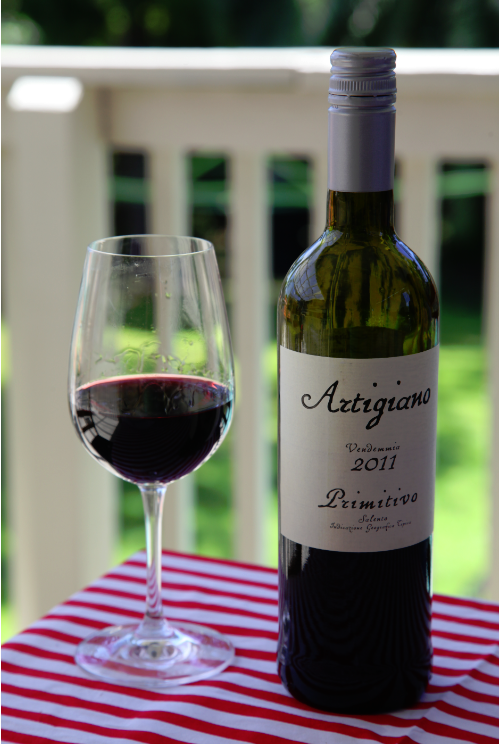 Not only is Californian Zinfandel Italian Primitivo, but Primitivo is Croatian Crljenak Kaštelanski … which reminds me of one of my favorite videos …. http://www.youtube.com/watch?v=1R3EnZdhYok …. and once again, I wish I was your neighbor. Now you have reason to watch it again because he says it. PS: I invite you to my Christmas Holiday Party on Saturday. Stop by! Cheers man! How best would I get there by public transport? Man I dig this blog! In my travels as a truck driver I see many wineries and vineyards all over the U.S. Ever since finding your blog and reading the awesome posts on a fave subject of mine I stop at some Chateaus or outlets and browse or ocassionlly taste, although I am by no means a qualified critic. But, I think wine making is an art form and shows love and dedication for perfection. I learn a lot from your blog, and I may one day actually know what I’m talking about. I’m looking forward to the day I can say “Hmmmm, I taste orange peel and oak” and others nod and agree. Thx for the info! See…? I told you I don’t know nuttin’!!! I wish I could come to one of your parties my good man…REALLY!!! Please accept these THREE AWARDS!!! One is “Blog of the year” One star award. If you need more starts, go to the link under the award. This is an easy Award to give out. I hope you can acccept. Thanks Shauny, you’re a legend and I love your blog. Cheers!! This is the best way to spend a Sunday. I’m glad I found your blog, now I will have an easier time picking out the best wines for my family this holiday season! Thanks for popping in to check us out. Cheers!! 15,18,20$ dollars the bottles? Why didn´t I get invited on this one. Man talk you said? Why didn´t I get invited on this one. Oh yeah. The food looks great… It’s 6 am and haven’t had breakfast yet, haha. LoL. I was starving so ignored convention. Which I normally do anyway. Seven hours of good wine, good pizza and good fun…sounds like a perfect Sunday! Pictures tell you guys had a great weekend. Definitely following this wine blog from now. Have you tried La Cigale Rouge Australian Red wine variety. I had it recently and loved it. Still left with 3 glasses of it! No, I haven’t, but I’d love to! Thanks for dropping in on us!! I love the table setup! My wife used to enjoy wine and had it from Pieroths.Offhand I can’t remember her favorite red but I see they do a 2012 Kangaroo Point, Cabernet Merlot from Australia.which I’m sure she’d have loved. For whites I have one bottle left of Pieroths Blue 2009 Burg Layer Schlosskapelle, Kabinet Nahe which was the only white to tempt her.As a boring teetotaler I wouldn’t know one from another but I recall them saying something about removing the skin meant no hangovers? Often it’s the preservatives though that can lead to hangovers. Cheers!! Looks like a wonderful time was had by all! After spending three years in Germany, in wine country, we are hooked on German wine. There’s some really good German wine out there. I’m glad you’ve discovered it! I don’t mind a good beer with pizza too myself! Thanks for stopping by and I hope to see you around. Cheers! You’d probably like the 2009 Primitivo di Manduria Sessantanni then. Thanks so much for dropping in. Nice! I am suddenly in the mood for Prosecco:) I have enjoyed some wonderful Savignon Blancs over the Thanksgiving holiday with turkey and potatoes etc. I don’t normally go for Sav Blancs, but it was recommended by my neighborhood wine store guy and was a great idea! Cheers! How did the Prosecco craving go? I find that I have to be in the right mood for Sav Blancs. Cheers! I hope you’ve found some good bottle to go with your wine since this comment!